For my ink pad organization, I use storage units from Stamp n’ Storage. I fell in love with the sturdiness of these wood units and the number of inks they can hold. After purchasing the units, I found that I used my inks more because they weren’t piled on top of each other and they were so easy to put away! I have two slim ink pad holders mounted on my wall next to where I work. These fit most ink pads that I use in my cardmaking and make it super easy to grab them and put them away. Also, the mounting system is genius and holds the heavy units really sturdy on the wall! 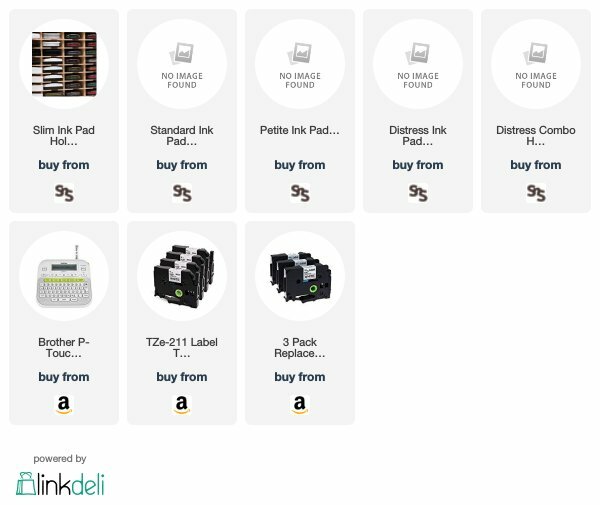 You can buy these units to hold the number of inks you have! I also use the Distress Ink and reinker holder on the counter behind my workspace. I use Distress Oxide inks a lot, so I thought it would be a good idea to have an organizer for them! I use this organizer to hold the ink pads with their blending tools next to them, but you can put their matching reinkers next to them as well. This has made it super easy for me to get more use out of my inks and blending tools! Below are all of the storage units used in today’s video linked for convenience. Compensated affiliate links used when possible (when you use these links it helps support me at no extra cost to you)… Thank you! Check out my full craft room tour video (Watch the full video HERE in HD)!